B vitamins are essential nutrients that help the body maintain cell metabolisms. Eating a variety of healthy foods high in B vitamins is essential. B vitamins are water-soluble nutrients that help to maintain the cell metabolism. It was once believed that these were a single vitamin which was simply known as vitamin B, but research has since revealed that there are several chemically distinct nutrients that can exist in the same foods. Generally speaking, supplements that have all eight B vitamins are referred to as a vitamin B complex while specific B vitamins will be referred to by name as listed below. Since B vitamins are important for health, you want to know the vitamin B foods to include them in your diet wisely. Benefits. All organisms require thiamine, but it can be synthesized in plants, bacteria or fungi. Animals must obtain B1 from dietary sources, making it an essential nutrient. When birds have a vitamin B1 deficiency, it can cause characteristic polyneuritis. Mammals suffering from a deficiency can develop optic neuropathy, Korsakoff's syndrome or beriberi, a disease that damages the cardiovascular or nervous system. A thiamine deficiency can be fatal if it is not treated. Less severe deficiencies can cause confusion, malaise, irritability and weight loss. Food Sources. Thiamine can be found in low concentrations in a variety of foods. Pork, yeast extract and yeast have some of the largest concentrations of thiamine. Generally speaking, cereal grains provide some of the most vital dietary sources of thiamine. Whole grains have more thiamine than those that have been refined since thiamine is mostly found in the germ and outer layers of grains, which would be removed during the refining process. Other foods that contain vitamin B1 include flax, sunflower seeds, oatmeal, whole grain rye, brown rice, cauliflower, asparagus, oranges, potatoes, liver and eggs. Benefits. Riboflavin helps the body metabolize ketone bodies, proteins, fats and carbohydrates. Light will naturally break down this vitamin, which makes it harder to obtain through dietary sources that have been cooked or are frequently exposed to high amounts of UV light when processing or cooking. Riboflavin deficiencies are common, either because you are failing to get enough riboflavin in your diet or because the body is not absorbing the nutrient properly. 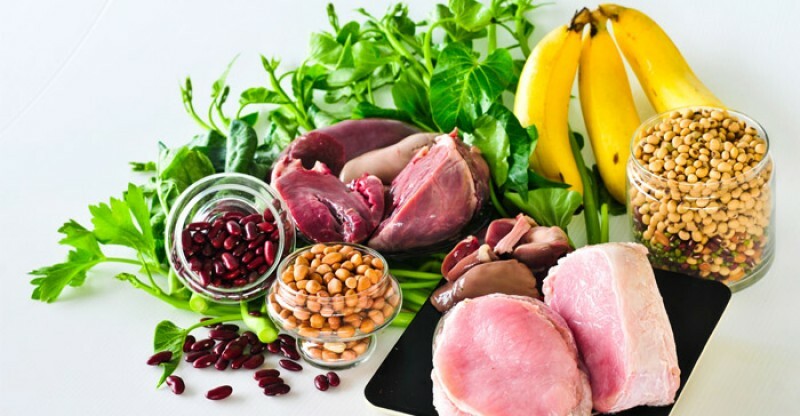 A deficiency of vitamin B2 can often lead to deficiencies of other vitamins because this will limit your body's ability to metabolize nutrients. Symptoms of riboflavin deficiency include dry or scaling skin, dry lips, inflammation of the mouth or tongue, mouth ulcers, cracking at the corners of the mouth or iron-deficiency anemia. So it is vital to find this kind of vitamin B foods. Food Sources. Vitamin B2 is commonly added to a variety of foods as a dye because when reduced, it naturally has a bright yellow-orange color. Some foods like breakfast cereal, baby food, sauces, processed cheese, pasta, milk products, energy drinks and fruit drinks are fortified with additional riboflavin. Natural sources of vitamin B2 include eggs, milk, cheese, meat and wheat bran. Grains such as wheat or rice also contain smaller amounts of riboflavin, but these are often more effective sources of the vitamin when they are enriched or consumed as a whole grain as much of the vitamin is stored in the hull which is removed during processing. Benefits. Niacin helps to break down fats, helping to manage the body's cholesterol and encourage proper metabolism health. It is especially important for pregnant women to take in high doses of vitamin B3 to ensure proper development for her child. Deficiencies of niacin can cause pandemic deficiency disease which can cause deficiencies of a variety of other vitamins including vitamin A, C, D or thiamin. Those that suffer from alcoholism or use maize as a staple crop tend to develop a niacin deficiency. A niacin deficiency can cause intolerance to cold, dementia, dermatitis, amnesia, delirium, diarrhea, inflammation of the tong or mouth, or death in extreme cases. However, taking in excessive amounts of niacin can cause dry skin, skin flushing, rashes and itching. Food Sources. Niacin can be found in many fruits and vegetables, including leafy vegetables, broccoli, tomatoes, carrots, sweet potatoes, avocadoes, asparagus and dates. Nuts, legumes and whole grain products are also high in niacin. Mushrooms, brewer's yeast, fortified energy drinks, eggs, chicken, halibut, tuna, salmon, kidney, heart and liver meats all contain high doses of niacin. Benefits. Pantothenic acid is key for enzyme activation and deactivation as well as signal transduction in the body. This is essential to aiding the body to decompose fats, carbohydrates and proteins. The body also uses vitamin B5 to produce enzymes that will allow the central nervous system to properly communicate with the brain. It is frequently used in cosmetic properties because it has moisturizing properties that are helpful for the skin. Some studies also indicate that B5 is helpful in treating acne, reducing stress, promoting weight loss and quality athletic levels, alleviating headaches and others. Food Sources. Most foods contain at least trace amounts of pantothenic acid. Food sources that have high amounts in this vitamin B include meats, whole grains, avocados, broccoli, rice, cereals, wheat bran, peanut meal, alfalfa, yeasts, condensed fish solutions and molasses. Benefits. Pyridoxine is used to help keep the potassium and sodium levels balanced in the body. It is also used to promote the production of red blood cells and allows the body to decrease homocysteine to keep the immune system functioning and balance female hormones. Deficiencies of vitamin B6 can lead to seizures, anemia, nerve damage, sores in the mouth and skin problems. Food Sources. This vitamin B foods include most seeds and nuts. Fortified breakfast cereals, chickpeas, enriched or long grain rice, bananas, cottage cheese, raisins, tofu, watermelon, spinach, squash, bulgur, marinara pasta sauce, potatoes, chicken breasts, sockeye salmon, yellow fin tuna, beef liver or ground beef also contain plenty of vitamin B6. Benefits. Biotin assists with cell growth, producing fatty acids and amino acids in the body. Vitamin B7 helps the body maintain a steady blood sugar level and transfer carbon dioxide. People frequently take biotin supplements to help improve nail and skin health, though there is not much evidence that it is very effective. Deficiencies of biotin are rare because intestinal bacteria will produce enough of the vitamin to fulfill daily requirements. Because of this there are no daily requirements for biotin intake. Food Sources. Those looking to increase their intake of biotin can consume raw egg yolks (however, consuming egg whites limits the amount of biotin in the body), Swiss chard, green leafy vegetables, liver, peanuts and Saskatoon berries. Benefits. Humans are not capable of synthesizing folic acid, so they will need to take in this vitamin B foods. Getting enough folic acid is essential for DNA repair and synthesizing. It is also used to assist with cell growth and division and red blood cell production. If you do not get enough folic acid in your diet during pregnancy, it can lead to neural tube defects in the embryo. Additional symptoms of folic acid deficiencies include mouth ulcers, forgetfulness, mental confusion, pregnancy complications, depress, cognitive declines, headaches, irritability, behavioral disorders, heart palpitations and swollen tongue. Food Sources. Foods that have high amounts of folic acid include kidney, liver, baker's yeast, green leafy vegetables, egg yolk, legumes, fortified grain products such as cereals, bread or pasta, and sunflower seeds. Foods with moderate amounts of folic acid include cantaloupe, honeydew melon, banana, grapefruit, strawberry, raspberries, corn, beets, tomato and other vegetable juices, Brussels sprouts, bok choy, broccoli, romaine lettuce and beer. Benefits. Cobalamins are essential for forming the blood and keeping the nervous system and brain functioning properly. Most cells in the body require cobalamins for a healthy metabolism and DNA synthesis regulation. It is also used in the production of energy and fatty acid synthesis. Only archaea and bacteria can produce enzymes to create vitamin B12, so most organisms will need to take in cobalamins through dietary sources. Food Sources. Vitamin B12 can only be taken in from animal sources. Those that do not eat animal products will need to use supplements to get their daily requirements fulfilled. Beef products, pork liver sausage, turkey, eggs, whole cow's milk, chicken, Alaska king crab, Pacific oysters, clams and cheese all contain vitamin B12. In many cases, raw meats contain more of this vitamin than cooked sources, but it is important to take caution when consuming meat products that have not been cooked as these can contain contaminants.